Festival Report: Snana-Yatra Festivities ~ The Toronto Hare Krishna Temple! 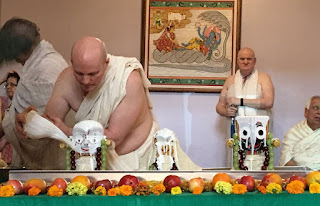 On Sunday, July 3, 2016, the Toronto Hare Krishna Temple continued it's countdown to the annual Ratha-Yatra (Festival of India) by celebrating Jagannatha Snana-Yatra almost 14 days before the grand festival. This celebration is an integral part of the Ratha-Yatra festival when their Lordships Sri Jagannatha, Sri Baladeva and and Srimati Subhadra are bathed. After bathing in special waters filled with love and devotion, Lord Jagannatha enacts a pasttime by becoming "sick". His sickness confines him and he receives special care for the next two weeks until he comes out at the Ratha-Yatra. At the Hare Krishna Temple, devotees congregated and started out the festivities by preforming an aarti ceremony amidst wonderful kirtan. Following the aarti ceremony, the bathing ceremony for their Lordships took place with an extravagant kirtan lead by Hari Bhakti Das Prabhu. The Deities were bathed in a rainbow of colors, with varieties of fruit juice, milk, honey, yogurt, and holy water. At the same time, the devotees were immersed in the kirtan and the mercy of the Lord. The evening continued with tantalizing tunes from the kirtan and a wonderful aarti and kirtan. Everyone who attend left beaming as bright as the full moon after enjoying a delightful vegetarian feast.